The wood tops (soundboards) of instruments contain lignin (also spelled lignen) http://en.wikipedia.org/wiki/Lignin Lignin acts like a torsion box between the hard winter lines and soft summer lines of wood. The instrument’s vibrating strings cause lignin in the top to “relax” and “loosen” by defined parameters of motion, subjectively improving the instrument’s audible performance vs. its prior state of being tight and stressed. “Play-in,” “run-in,” and “seasoning” describe the relaxing/loosening process. Instruments new, recently serviced, and not played regularly benefit from play-in. We have noticed even guitars played regularly improve after a half hour or so of use. Play-in normally occurs by playing the instrument. 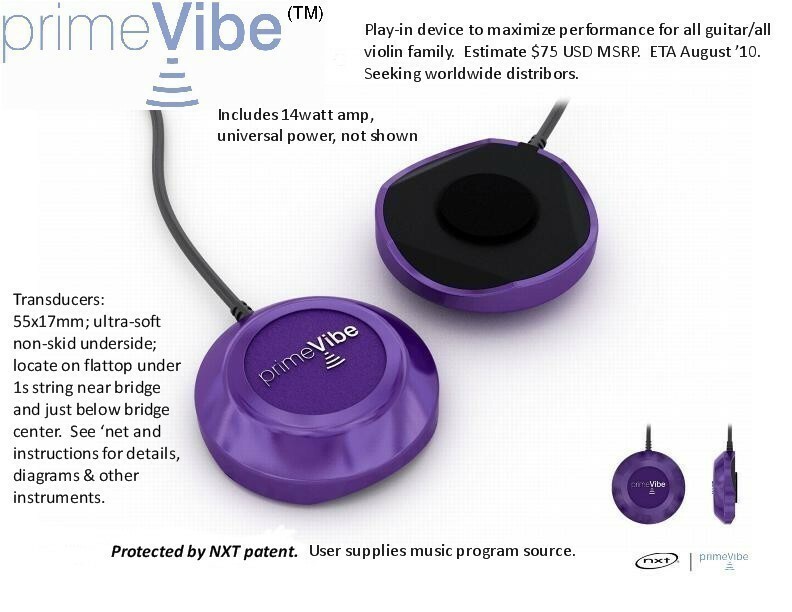 primeVibe™ functions by applying direct musical vibration to the instrument’s top via special transducers. The patented NXT transducers pump music into a solid vs. the normal speaker function of moving air particles. Holding the “exciters” in the air produces almost no sound. Replace the exciters on the instrument and the sound reappears. The contact surface on the transducer underside and the outer jacket of the transducer wire leads are smooth high-density rubber with some silicone content. Owners of high-end instruments with nitrocellulose finish can click HERE for pertinent information. Vinyl is caustic on instrument finish and is not employed on the transducer underside or the outer wire jacket. When relocating transducers on the instrument elevate them rather than drag or slide them. Julian Fordham, PhD. in Materials Science at then-NXT (now Hi-Wave Technologies) was the team leader for primeVibe research and design. Master Luthier Ryan Thorell consulted on the design and materials employed in primeVibe.